Nasal polyps can occur in association with more general diseases such as adult-onset asthma an uncommon association is with aspirin intolerance, and very occasionally they occur in children with cystic fibrosis. Adult-onset asthma rather than childhood asthma is associated with nasal polyps. 20-40 of patients with polyps will have asthma as well. Eight in every 100 patients with polyps also have asthma and aspirin sensitivity, and in these patients the polyps tend to recur more than in other people. Nasal polyps come from the lining of the nose and often originate from the ethmoid sinuses (in the face, either side of the nose), which drain into the nasal cavity. Nasal polyps contain inflammatory fluid and while they can be associated with allergy and infection, the exact reason why some people get them and not others is unknown. 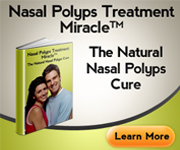 Allergy is no more commonin people with nasal polyps than in people who do not have polyps. Most inflammatory nasal polyps are known to shrink when nasal sprays or drops containing topical nasal steroids are used. New local nasal steroid drops or sprays can be taken to control symptoms for many years as very little is absorbed into the body they can work well, but it may take up to six weeks of treatment before their full benefit is felt. Steroids in tablet form can provide good relief, but the effects are short-lived and they are used sparingly because of concerns about side effects. If medicines don't work, then surgery can usually help. If the lamina papyracea is cracked or a segment is removed during the procedure, this may cause a minor ecchymosis (Fig. 12.7) this will settle spontaneously in 3-4 days. If the orbital periosteum is traversed, then orbital fat prolapses into the nasal airway. Although fat has a yellow hue, it can look remarkably like nasal polyps. 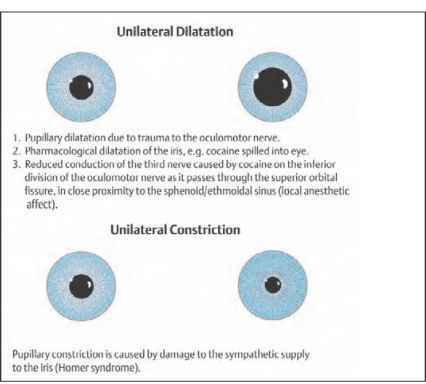 Palpation of the closed eye by the assistant, or you, will tell whether it is orbital fat as it will move abruptly with this maneuver. If it is fat, do not panic there is a temptation to push it back into the orbit (this will fail), to pull it out (this will make the damage to the orbit worse), or to cauterize it. None of these is necessary and they may cause more harm. Be aware that only 6 of patients with allergic rhinitis have hypertrophic or polypoidal mucosa, and that the majority of patients with nasal polyps do not have atopic disease. Patients with polyps and coexisting atopy usually respond well to the same treatment as those with rhinitis. If a patient has severe nasal polyps, particularly medial to the middle turbinate, it is worth giving them a preoperative course of oral steroids to reduce the Fig. 3.33 Nasal polyps a before and b after oral steroids, just prior to surgery. Fig. 3.33 Nasal polyps a before and b after oral steroids, just prior to surgery. It is important that all tissue, whether it looks harmless or not, is sent for histological examination. We found that 1 of 2021 nasal polyps had pathology that differed significantly from the clinician's diagnosis, and this then altered management (Diamantopo-polous and Jones, 2000). Endoscopic biopsy can reduce morbidity (Trimas and Stringer, 1994) as well as preserving oncological barriers so that an en bloc resection can potentially be carried out without compromising oncological resection as well as increasing the rate of histological diagnosis. Biopsy should ideally be done after imaging so that the artifacts that occur after surgery do not complicate image interpretation (Myers and Carrau, 1993). Bachert C, Gevaert P, Holtappels G, Johansson SG, van Cauwenberge P (2001) Total and specific IgE in nasal polyps is related to local eosinophilic inflammation. Journal of Allergy and Clinical Immunology 107(4) 607-614. Diamantopopolous I, Jones NS (2000) All nasal polyps need his-tological examination an audit based appraisal of clinical practice. Journal of Laryngology and Otology 114 755-759. Drake-Lee AB (1987) Nasal polyps. In Kerr AG, Groves J, eds. 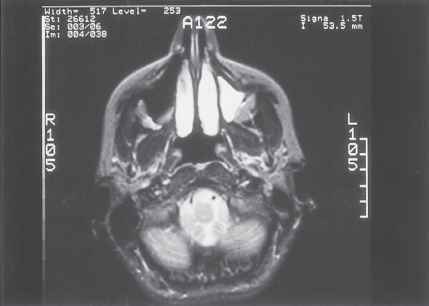 Scott-Brown's Otolaryngology. London Butterworths, pp. 142-153. Slavin RG (1997) Nasal polyps and sinusitis. JAMA. 278 184954.